Dr. Gonzales is an Elite Invisalign Provider in Dublin and Tracy, CA. Invisalign straightens your teeth using series of clear, plastic aligners. With clear braces or ceramic braces, the wire is still typically visible at a distance, and the brackets are almost always noticeable up close. While clear braces or ceramic braces might be a good option for someone who is frequently in front of a camera or takes a lot of pictures, it isn’t a completely clear solution. With Invisalign, the aligners are completely clear, so no one will even know you are straightening your teeth! EAT WHAT YOU WANT & PLAY WHAT YOU WANT WITH INVISALIGN! Invisalign aligners are removable, so you are able to straighten your teeth without dietary restrictions. This also means you don’t have to worry about adjusting to play your wind or brass instrument or find a specific mouth guard when you play sports! You’ll simply remove your trays when you’re ready to eat or play! With Invisalign, you have more freedom. Additionally, with traditional metal braces, you may need an adjustment period to essentially relearn how to play a wind or brass instrument. If you play sports, you have to wear a special mouth guard to protect your mouth and appliance. With Invisalign, the trays are removable, so you don’t have to worry about an adjustment period for playing instruments or getting brace-ready mouth guards. You can play what you want, when you want. No limitations! Getting used to traditional metal braces can sometimes be a pain, literally. The sharp metal appliances can cause irritation to your gums and cheeks while you get used to the brackets and wire on your teeth. You will often have to use special wax when the irritation becomes unbearable. With Invisalign, the smooth plastic aligners cause no irritation. You don’t have to fret when you run out of wax, because there is no need for it! You simply pop the aligners on and go! With Invisalign aligners, you brush your teeth and gums the same way you did before your treatment process began. You simply remove the aligners to brush and floss. Your aligners are easy to care for as well; you just brush and rinse before or after you brush your teeth! Invisalign keeps it easy for you! Invisalign Teen features a built-in easy-to-track indicator that lets your child know when it is time to use the next set of trays. The blue dot on the outside of the tray itself turns clear when it is time to change to the next series of clear aligners. Now your child doesn’t have to worry about unappealing school photos, uncomfortable first dates, or missing out on having their favorite foods with friends! Invisalign Teen clear aligners are also comfortable and durable, so your child doesn’t have to worry about the discomfort of poking and broken wires. 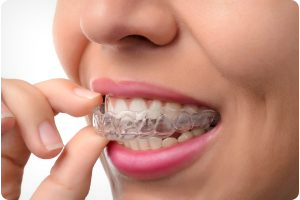 Furthermore, while most teens are very compliant with aligner wear and tear, most parents worry about their teens losing or misplacing their clear aligners. Thankfully, Invisalign Teen includes several free replacement aligners should they be needed. Let Invisalign Teen take the stress of braces out of your child’s teen years! "Best orthodontic office in the bay area!! " "The Smith family loves this office! I am so thankful my kids get to go to Dr Gonzales! Thanks for making us feel so special every time we walk in the door." "Dr. Gonzalez and his team always gave excellent service. Staff is very friendly and always made my daughter feel relaxed. She has a beautiful smile. Thank you!" "We are extremely pleased with Dr. Gonzales and his wonderful staff. He and his staff are patient and understanding and they make my son feel completely at ease. They make every visit stress-free and fun for siblings who have to wait in the waiting room too! *thumbs up* Thank you!!!" "Dr. Gonzales and his staff are truly outstanding. They have an excellent manner with children, while being extremely competent and professional. I would feel comfortable recommending their services to anyone." "Dr. Gonzales and his staff are truly outstanding. They have an excellent manner with children, while being extremely competent and professional. I would feel comfortable recommending their services to anyone. "George C.
"We are extremely pleased with Dr. Gonzales and his wonderful staff. He and his staff are patient and understanding and they make my son feel completely at ease. They make every visit stress-free and fun for siblings who have to wait in the waiting room too! *thumbs up* Thank you!!! "Betty W.
"Dr. Gonzalez and his team always gave excellent service. Staff is very friendly and always made my daughter feel relaxed. She has a beautiful smile. Thank you! "Tammy F.
"The Smith family loves this office! I am so thankful my kids get to go to Dr Gonzales! Thanks for making us feel so special every time we walk in the door. "Laurie S.
"Best orthodontic office in the bay area!! "Colleen R.
*The reviews listed are from actual patients of Dante Gonzales Orthodontics. Individual results may vary. Reviews are not claimed to represent results for everyone. Dr. Dante Gonzales, our 5-star-rated Dublin, CA, orthodontists, offer the most advanced braces for children, braces for teens and braces for adults, including metal braces, clear braces, Invisalign, and Invisalign Teen. Come experience Dante Gonzales Orthodontics! You will see we offer effective braces and orthodontics with a smile to patients in and around Dublin, CA, Pleasanton, CA, San Ramon, CA, Danville, CA, Livermore, CA, Castro Valley, CA, Tracy, CA, San Leandro, CA, Hayward, CA and Fremont, CA. conveniently located at our Dublin or Tracy orthodontics offices.